This post first appeared on the BEAM Exchange blog. Market systems are complex adaptive systems and market systems development is a complex task. This entry was posted in development and complexity, training and tagged complexity, narrate, tony quinlan, training on 19/06/2018 by Marcus. I’m really excited to announce a new training course that I have put together with Tony Quinlan from Narrate, which will be starting in September. As readers of my blog know, I have applied concepts and principles of complexity to my work in international development for a long time. In this course, I will share these concepts, principles and experiences I have made and accompany the participants to make sense of their own experiences and create new experiences in applying complexity concepts. 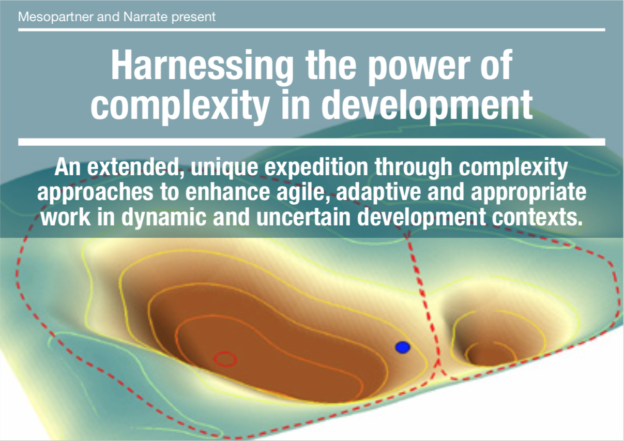 Harnessing the power of complexity in development – An extended, unique expedition through complexity approaches to enhance agile, adaptive and appropriate work in dynamic and uncertain development contexts. This course gives you a unique opportunity to gain experience and expertise in complexity, through a guided journey covering the fundamentals of complexity. Projects taken from participants’ real-world situations (not hypothetical case studies) will be used to apply these principles, teams being mentored all the while by two expert practitioners. This entry was posted in development and complexity, my work and tagged complexity, course, narrate, tony quinlan, training on 17/05/2018 by Marcus. Last week, I participated at a Cognitive Edge webinar and presented together with Tony Quinlan on our experiences on using SenseMaker® in social change work. You can access the recording of the webinar and download my slides. I hope you are enjoying the festive season (if applicable) and wish you all a great start into the new year! Thanks a lot for your continuous support by reading and sharing my blog and re-tweeting it into your networks! This entry was posted in presentations and talks and tagged sensemaker, social change, tony quinlan, webinar on 28/12/2017 by Marcus.